BOO! The scariest night of the year is almost here and Phoebe already has her Halloween card ready. How about you? Are your candies ready to be given out to trick-or-treating kids and have you decided on your Halloween costume yet? If I were living abroad where Halloween is celebrated with ghoulish parties and haunted homes decorated with jack-o-lanterns and what not, I would definitely go as a Genie Princess this year! I found this perfect genie costume online and it's going for a very cheap price of only $26.95. Mind you there were many other Costumes to choose from and I especially like the fairy costumes but I think this genie outfit would be fun to pull off. 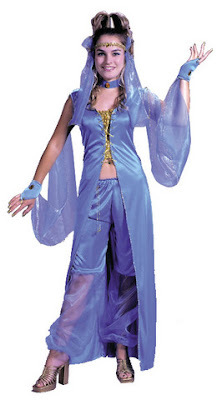 Available from sizes 4-14, this cute genie costume comprises a full length vest with arm veils and jewelled cuffs, capri-style pantaloons with gossamer legs, belly chain, headpiece and choker. I'm not sure if this costume comes in pink but whatever color I end up with, I'd surely enjoy playing my Genie Princess character to the hilt! So make a wish everybody and leave it in my comment box. Tell me what your wish is and GP will do her best to make your Halloween extra magical this year! ALAKAZAM! haha, made it this time? Made it Elai, catching up with GG edi hohoho! Thanks sweetie, I heart my outfit too, now where to go looking like dis here? LOL! Woo hoo, thanks Elai! What‘s ur costume this year he he…. the box appeared again. so now i click YES?? Laundry day Mon? I got loads of laundry to do hahahahahha! Wat softener u use eh? do you have to activate RM or something? yes, i just signed in to RM early this month, never got opps yet... do i just wait? ah ic, i don't login regularly, do opps expire? Ok and approved right? If u have PR then RM will surely give u opps, wait for it! Yeah but all gaming so I wanted to chop the 10 bucks one, then gone edi huhuhuhuhu…. oh downy a bit pricey huh... i used softlan before I like dat one oso!! ah ic, hahah! thanks for that, dear! Yes downy small bottle about 5 something compared to big bottle softlan for abt the same price… but downy is concentrated it seems so u don have to use as much… fresh, clean spring smell, I love! Hahahahah dats why la only gamin PBs at RM nowadays and then I oso got the webhosting one, tak kan la wan to do again? I did edi web hosting last month here and at meows! Yeah that’s a good price nowadays cause can save.. no money edi hahah! Wat category to change to?? I’ve tried weddings, blogging,but nothing there…I haven changed category this month..
hhahahahah.. love the smiley genie GP!!! hahaha... gelek gelek!! lol! I love witchcraft and wizardy. I love Hocus Pocus. Very entertaining. Starring Bette Midler, Sarah Jessica Parker and cant remember the other one. HuhU. then i ll go as Nenek Kebayan, ehh silap Pok Kebayan. Or, i ll go as Pochong! lol. Hop Hop hippity hop, sambil hop sambil lawat blog. Ish seramlah pulak cakap fasal pochong sebab duduk rumah sorang la ni. thanks for being my FC today. your pretty avatar is up. hope you'll have a wonderful weekend. Happy Deepavali. Wah! Cantiknya costumes "Genie Princess" tu, memang suitable for you. I can assure you that you are going to look great in it! Recent blog:=- I need a break badly! You're never to old to enjoy Halloween, even if all you do is hand out candy at the door. But its a lot more fun when you've got a cool costume. Wish I could fit into a genie costume without looking ridiculous, but those days are long gone... looks like I'm just going to have to dress up as a pumpkin again this year! I haven slept…how was ur weekend Mon? This is what I would like to wear for Halloween Bill he he, how abt you? Thanks Mon, I was asleep that time sure missed ur buzz2 huhuhuhuhuhuhuh…..
We don celebrate but my blog celebrates mah! Happy Halloween Tekkaus! Yay me got FC, thanks for the linky love LR, hugs!